Use steel rivets for very heavy duty jobs and when riveting steel to steel. Use aluminum rivets for lighter weight jobs and materials such as aluminum, fabrics, plastics, leather, etc. Use washers when joining soft materials or when existing hole is oversize. Use steel rivets for very heavy duty jobs and when riveting steel to steel. Use aluminum rivets for lighter weight jobs and materials such as aluminum, fabrics, plastics, leather, etc. Use washers when joining soft materials or when existing hole is oversize. Used for craft, hobby and finish carpentry projects. Sturdy plastic packaging reduces staple breakage. Fits TR200, TR250, TRE500, TRE550, TRE650 Electric Brad Nailers. SureBonder Blind Rivet Washer, Short, SureBonder, 1/8 in Nominal, Steel Use steel rivets for very heavy duty jobs and when riveting steel to steel. Use aluminum rivets for lighter weight jobs and materials such as aluminum, fabrics, plastics, leather, etc. Use washers when joining soft materials or when existing hole is oversize. Use washers when joining soft materials or when existing hole is oversize. Use washers when joining soft materials or when existing hole is oversize. Use washers when joining soft materials or when existing hole is oversize. Used for craft, hobby and finish carpentry projects. Sturdy plastic packaging reduces staple breakage. Fits TR200, TR250, TRE500, TRE550, TRE650 Electric Brad Nailers. SureBonder Blind Rivet, Long, SureBonder, 3/16 in Diameter, 0.376 - 1/2 in Grip, Aluminum Rivet, Aluminum Mandrel SureBonder Blind Rivet, Short, SureBonder, 3/16 in Diameter, 0.063 - 1/8 in Grip, Aluminum Rivet, Aluminum Mandrel Used for joining soft materials, such as leather, or when the hole is oversized; adds strength to rivet hole. Use steel rivets for very heavy duty jobs and when riveting steel to steel. Use aluminum rivets for lighter weight jobs and materials such as aluminum, fabrics, plastics, leather, etc. Use washers when joining soft materials or when existing hole is oversize. Use steel rivets for very heavy duty jobs and when riveting steel to steel. Use aluminum rivets for lighter weight jobs and materials such as aluminum, fabrics, plastics, leather, etc. Use washers when joining soft materials or when existing hole is oversize. Ideal for a variety of indoor and outdoor projects including wood and artificial trim, picture frames and detail work; also good for upholstery, crafts, trellis and screen repair; for use in thin brad nail applications where wood thickness is less than 5/8"; helps to offer the gripping power required to hold materials together; brads are 18 gauge steel and brown head for color matching; for use in "Arrow" Powershot, Surebonder, "Stanley", "Sears Craftsman", "Black & Decker" and "Master Mechanic". Ideal for a variety of indoor and outdoor projects including wood and artificial trim, picture frames and detail work; also good for upholstery, crafts, trellis and screen repair; for use in thin brad nail applications where wood thickness is less than 5/8"; helps to offer the gripping power required to hold materials together; brads are 18 gauge steel and brown head for color matching; for use in "Arrow" Powershot, Surebonder, "Stanley", "Sears Craftsman", "Black & Decker" and "Master Mechanic". Medium strength aluminum can be used with aluminum and where rust is a potential problem. Reusable, full visibility packaging simplifies product selection and storage. Medium strength aluminum can be used with aluminum and where rust is a potential problem. Reusable, full visibility packaging simplifies product selection and storage. Used for joining steel to steel. Reusable, full-visibility packaging simplifies product selection and storage. High strength, all steel construction. Used for joining steel to steel. Reusable, full-visibility packaging simplifies product selection and storage. High strength, all steel construction. Medium strength aluminum can be used with aluminum and where rust is a potential problem. Reusable, full visibility packaging simplifies product selection and storage. Used for joining steel to steel. Reusable, full-visibility packaging simplifies product selection and storage. High strength, all steel construction. Use steel rivets for very heavy duty jobs and when riveting steel to steel. Use aluminum rivets for lighter weight jobs and materials such as aluminum, fabrics, plastics, leather, etc. Use washers when joining soft materials or when existing hole is oversize. Use steel rivets for very heavy duty jobs and when riveting steel to steel. Use aluminum rivets for lighter weight jobs and materials such as aluminum, fabrics, plastics, leather, etc. Use washers when joining soft materials or when existing hole is oversize. Medium strength aluminum can be used with aluminum and where rust is a potential problem. Reusable, full visibility packaging simplifies product selection and storage. Medium strength aluminum can be used with aluminum and where rust is a potential problem. Reusable, full visibility packaging simplifies product selection and storage. Use steel rivets for very heavy duty jobs and when riveting steel to steel. Use aluminum rivets for lighter weight jobs and materials such as aluminum, fabrics, plastics, leather, etc. Use washers when joining soft materials or when existing hole is oversize. Arrow Brad Nail, 18 ga, 1-1/2 in Length, Round Head, Chisel Point, Round Shank, Steel, Galvanized, For Use With: EBN320 Red Electric Brad Nail, Brown, For Indoor/Outdoor Use Use steel rivets for very heavy duty jobs and when riveting steel to steel. Use aluminum rivets for lighter weight jobs and materials such as aluminum, fabrics, plastics, leather, etc. Use washers when joining soft materials or when existing hole is oversize. Use steel rivets for very heavy duty jobs and when riveting steel to steel. Use aluminum rivets for lighter weight jobs and materials such as aluminum, fabrics, plastics, leather, etc. Use washers when joining soft materials or when existing hole is oversize. Medium strength aluminum can be used with aluminum and where rust is a potential problem. Reusable, full visibility packaging simplifies product selection and storage. Medium strength aluminum can be used with aluminum and where rust is a potential problem. Reusable, full visibility packaging simplifies product selection and storage. Used to connect gutter parts together and fasten other light-gauge metals. Theses rivets feature durable aluminum construction. Arrow Brad Nail, 18 ga, 2 in Length, Round Head, Chisel Point, Round Shank, Steel, Galvanized, Brown, For Indoor/Outdoor Use Used to connect gutter parts together and fasten other light-gauge metals. Theses rivets feature durable aluminum construction. Made of 18 gauge steel, head hides brad in wood. Medium strength aluminum can be used with aluminum and where rust is a potential problem. Reusable, full visibility packaging simplifies product selection and storage. Medium strength aluminum can be used with aluminum and where rust is a potential problem. Reusable, full visibility packaging simplifies product selection and storage. Medium strength aluminum can be used with aluminum and where rust is a potential problem. Reusable, full visibility packaging simplifies product selection and storage. Use steel rivets for very heavy duty jobs and when riveting steel to steel. Use aluminum rivets for lighter weight jobs and materials such as aluminum, fabrics, plastics, leather, etc. Use washers when joining soft materials or when existing hole is oversize. Use steel rivets for very heavy duty jobs and when riveting steel to steel. Use aluminum rivets for lighter weight jobs and materials such as aluminum, fabrics, plastics, leather, etc. Use washers when joining soft materials or when existing hole is oversize. Rustproof aluminum heads with steel shanks, Hardened, 100 lb (45 kg) ultimate shear strength, 150 lb (68 kg) ultimate tension strength, Neatly organized in a divided PVC storage case with chart inside box lid for easy selection. All steel chrome plated body. Ergonomic finger groove handle base. Bottom loading for easy jam cleaning. Staples are interchangeable with Arrow JT-21. Staple Sizes: 1/4"-6mm and 5/16"-8mm. Includes: 300 Piece Staples. Made of 18 gauge steel, head hides brad in wood. Great for screen repairing, light upholstery work, arts and crafts projects and scores of other light duty household tacking chores. Comfortable soft grip and handle, easy squeeze mechanism, built-in stapler remover, large reload window on bottom of stapler. Reusable, 6 storage compartments 25 each 1/8" x 1/8" aluminum and steel; 20 each 1/8" x 1/4" aluminum and steel; 15 each 1/8" x 1/2" aluminum and steel. Perfect for everyday stapling needs around the home or office. Lightweight with convenient handle lock. Quick clear mechanism. Chrome plated steel construction. Uses 1/4" and 5/16" light duty staples. All steel construction with a chrome finish, contoured handle, plastic stop, jam proof mechanism and visual refill window. Used in applications such as displays, silk screens, light upholstery, crafts and posters. Load full strip of (100) ARROW staples of .030 wire in sizes 1/4", 5/16" and 3/8" staples. Visual refill window. Perfect for screen repairing, light upholstery work, kitchen shelf trimming, closet lining, cornice covering and scores of other light duty household tacking chores. No. JT21M : All steel construction. Jam-proof mechanism. Hand-contoured handle. Built-in staple lifter. Household baked enamel finish. No. JT21CM: Durable hi-impact molded plastic housing. Safety handle lock. All steel channel and track for non-wearing, jam-proof performance. Easy to squeeze design - female can squeeze with one hand; comfortable ergonomic grip, precise; user friendly forward action design; compact for easy storage; ideal for projects around the home: home decor, decorating, quick repairs around the house, crafting and hobby projects; uses "JT21" staples in three sizes up to 3/8" (10mm). All steel construction; chrome finish. Hand guide loop. Camp-actuated double leverage. Deep 2-1/2" throat. Easy-to-get-at mechanism. Loads (150) No. P22 staples only, in two sizes, 1/4" (sku # 600.1283) and 5/16" (sku # 424.3184). All Steel Construction With Non Slip Grip Handle. Easy Access To Remove Jams. Uses All Brands & Sizes Heavy Duty Staples: Arrow T50 (Narrow Crown), Duo-Fast (Wide Crown), PowerFast (Wide Crown), Bostitch (Power Crown). Staple Sizes: 1/4" -6mm, 5/16"-8mm, 3/8"-10mm, 1/2"-12mm, 9/16"-14mm. Use for everyday stapling needs around the home or office. Lightweight with convenient handle lock for safe storage, quick jam clear mechanism saves time and hassle, chrome plated steel construction for durability. Chrome plated steel construction for durability; soft rubber grip handle; bottom loading magazine saves time and hassle; visual refill window shows the user if they have staples loaded; uses T50 stples: 1/4" (6mm - sku #s - 611.7238, 187.2142); 5/16" (8mm - sku #s - 584.6472, 509.4974); 3/8" (10mm - sku # 962.6045); 1/2" (12mm - sku #s 192.8522, 060.7077); 17/32" (13mm) and 9/16" (14mm); designed in USA. Use steel rivets for very heavy duty jobs and when riveting steel to steel. Use aluminum rivets for lighter weight jobs and materials such as aluminum, fabrics, plastics, leather, etc. Use washers when joining soft materials or when existing hole is oversize. Use any brand or size of heavy duty staples. A unique black painted All in 1 staple gun. Easy drop in staple loading. Viewing window lets you know if you need to load staples. Use with: Surebonder #4, #5, #6, #11 heavy duty staples or Arrow T50, Powerfast, Stanley, Duo-Fast, Bostitch, Craftsman, Master Mechanic, Do-it, Ace Hardware, Black & Decker and Unifix staples. The compact design and precision make it easy to use one-handed, leaving your other hand free to assist in your project, such as holding your fabric taut; powerful; uses T50 staples: 1/4" (skus 611.7238, 187.2142), 5/16" (skus 584.6472, 509.4974), 3/8" (sku 962.6045) and 1/2" (skus 192.8522, 060-7077). All steel construction; high carbon hardened steel working parts. Visual refill window. Patented jam-proof mechanism. Easy double leverage operation. Loads (85) Arrow No. T-50 staples only of .050 wire in 6 sizes; 1/4", 5/16", 3/8", 1/2", 9/16" and Ceiltile from light to heavy duty work. Used by building contractors, home do-it-yourselfers, and speciality trade applicators. Exclusive anti-jam mechanism. Low stroke handle to reduce hand fatigue. High power and penetration. Easy slide full stick staple load. Lightweight die cast aluminum design with steel handle, over molded rubber grip for comfort and convenient bottom loading for quick and easy reloading. Nickel chrome plated steel magazine. Used for house wrap, tar paper. Weight 1.9 lb., magazine capacity 84 staples, 1/4" ? 9/16" STCR5019 series Power Crown staples; Orgill sku#s, 160.8504, 341.8647, 433.9438, & 744.7915. 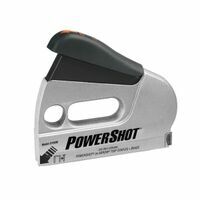 Arrow Staple and Brad Nail Gun, Heavy Duty, Series: PowerShot, Die Cast Aluminum, For Trim/Molding, Roofing, Housewrap, Flooring and Picture Framing Great for wiring projects; compact; powerful; precise; grooved guide ensures consistent stapling; for wires up to 1/4" (6mm) diameter; uses T25 staples (sku #s: 415.8796, 415.8812, 415.8846). Ideal for marine applications; rustproof and will not corrode in salt water; should not be used and will corrode with any wood that has been treated with ACQ (pressure treated wood). Fits Arrow T50, HT50, T50X, HT55BL, T55BL, TT50, T50PBN, T50 RED, T50 Elite and other T50 staple guns. Easy-squeeze technology helps reduce actuation force; anti-jam magazine prevents jams and misfires; heavy-duty stapling mechanism for durability; surface guard to prevent damage to underlayment material; ergonomic design is weighted forward for comfortable use; uses Dewalt Heavy Duty Staples series DWHTTH700 available sizes 5/16" (8mm), 3/8" (10mm), 1/2" (12mm), also uses same range of Stanley TRA700 series Heavy Duty Staples plus Arrow T-50 Heavy Duty Staples. Durable tool can drive five types of fasteners, giving you the ability to take on a range of jobs. High/low power switch provides increased flexibility for a wide array of applications. Integrated wire guide makes fastening cable and wire quick and easy. Interchangeable belt clip fits on belts and pockets of both left and right-handed users. Lightweight die-cast aluminum housing design for durability. Uses DEWALT heavy-duty staples (DWHTTA700 series), Stanley (TRA700 series sku #s: 244.4123, 942.1983, 224.2592, 698.8323 and 083.6304) or Arrow T50 heavy-duty staples up to 9/16 in. (14 mm) in length; uses Stanley 18-gauge brads up to 5/8 in. (16 mm) in length; uses Stanley round crown staples (CT100 series) or Arrow T25 series up to 9/16 in. (14 mm) in length; uses Stanley light duty staples (TRA200 series) or Arrow JT21 series up to 3/8 in. (10 mm) in length; uses Stanley flat narrow crown staples (CT200 series) or Arrow T20 series up to 9/16 in. (14 mm) in length. Fires narrow crown staples. Made of die cast Aluminum with a easy to use high/low power setting and the ability to drive 18 gauge brad nails up to 1" in size and staples 1/4" to 9/16". Features an ergonomic grip, quick bottom load, shot meter and resists jams. Used in applications such as insulation, woodworking, upholstery, general repairs, screening, trim/molding, roofing, housewrap, flooring and picture framing. Heavy duty design with more driving power. All metal drive channel for better penetration. Duel power (Hi/Lo) for hard and soft materials. Flush-nose design for stapling in tough spots. 8" cord. Easy squeeze staple gun operates as a staple gun, nailer, cable tacker and screen/canvas specialty tool. Built-in, retractable wire guide. Handle locks down for storage. Super soft slip-resistant grip for extreme comfort. Dual power lever (Hi/Lo) for hard and soft materials. Ergonomically-designed. Uses Brads: 1/2", 5/8"; Uses Staples: Stanley Sharp Shooter TRA 700 Series or Arrow T-50 Staples - 1/4", 5/16", 3/8", 1/2", 9/16". For wires up to 1/4" diameter. Specifically designed for safe, fast and efficient low voltage wire fastening. Tapered striking edge gets into close corners. Grooved guide positions wire for proper staple envelopment. Grooved driving blade halts staple at right height to prevent wire damage. Round crown staple fits snugly around wire. Widely used in telephone, electrical, electronics and communications fields. All-steel with chrome finish. Loads (85) T25 staples with 1/4" crown-divergent point of .050 wire in 9/32", 3/8", 7/16" and 9/16" leg lengths. Use with: 415.8796, 415.8812 or 415.8846 staples. Boxed. Ideal for: upholstery, general home repair; features: "Spiral-Drive" technology for consistent driving power; works with T50 staples up to 1/2" (447.9101, 412.2685, 447.9184, 447.9192 and 447.9200); compact design is easy to use; easy access magazine release for quick reloading; cordless version features a 3.6v Lithium-ion battery for up to 500 shots per charge. Tacker is lightweight aircraft aluminum housing, comfort soft grip handle with lock and takes both round crown and flat crown staples. Tool is 30 percent easier to squeeze, weighs 1-1/2 lbs., has an anti-jam mechanism, hi/lo power adjustment, built in wire guide, quick drop in loading and a narrow front allows stapling in tight spaces. Powerful performance for most trimming, small edge forming, decorative woodworking and hinge routing applications. Quick adjust button that allows for quick adjustment up to 1''. Spindle lock button allows for single wrench bit changes. Allows for quick depth adjustment up to 5/8''. Variable speed allows for precision performance that's right for each job. Variable speed reversing, two-finger, rubber trigger for increased comfort, heat-treated steel gears for long life and durability, high torque for deck building, drywall and heavy gauge steel stud framing, depth sensitive nosepiece for consistent fastener depth, excellent ergonomics. Specs: no load speed 0-2,500RPM ,standard clutch, 132 in/bs torque, max fastener size #12, weighs 3.5lbs. Variable speed control dial (10,000-30,000 rpm) enables user to match the speed to the application. Smooth rack and pinion fine depth adjustment system for more precise settings. Slim and ergonomically designed body for increased comfort and control. Quick release cam lock system for easy depth adjustments and base removal/installation. Electronic speed control maintains constant speed under load. Soft start feature for smooth start ups. Base accepts industry standard template guides. High visibility base design for improved handling and performance. Base can be removed quickly to install other bases (plunge, tilt and offset). Heavy duty aluminum motor housing engineered for increased durability. Shaft lock for quick and easy bit changes. Durable flat top design for added convenience when changing bits. Non-marring high durability base insert for increased work place protection. Easy to read depth scales. Uses 1/4 shank router bits. Double insulated. Ideal for routing small profiles, dovetailing, door hinges and more. Lightweight with variable speed reversing, excellent ergonomics, metal gear housing for jobsite durability and increased reliability, depth-sensitive nosepiece for consistent fastener depth, rubber grip and two-finger trigger for increased comfort and greater control, heat treated steel gears for long life and durability. Specs: no load speed 0-4,000RPM, standard clutch, 81 in/lbs max torque, max fastener size #8, weighs 3.1lbs. Features include the smooth rack-and-pinion fine depth adjustment system for more precise settings, dual L.E.D. lights to illuminate the work surface, and a quick release cam lock system for convenient depth adjustments and base removal/installation. Aluminum housing and base for increased durability and accuracy. Brushless motor efficiently uses energy to match torque and RPM to the changing demands of the application. On/Off button with separate lock button helps prevent accidental start-up of the tool for user and workpiece protection. Soft start feature for smoother start-ups and better accuracy. Specs: 10,000 - 30,000 RPM, 1-9/16" plunge capacity, fixed base, 5-1/4" length, and 4.5 lbs weight with battery. Includes: 1/4" and 3/8" collet, (2) spanner wrenches, (1) straight guide, template guide, wrenches (battery and charger not included). Variable speed control, ergonomic tactile grip and two finger trigger for user comfort and balance, ramp off depth locator for easy depth adjustments, all metal gear case and diaphragm, removable belt clip with bit storage, used for controlled depth fastening. Specs: 120AC, no load RPM is 0-2,500, Snap-Action clutch, 1/4" hex drive, max HP is 0.9, double insulated, switch trigger type, trigger lock, soft grip handle, spindle offset 0.92 in., fixed 10 ft. 2-wire rubber cord, 12-1/8" long, weighs 3.7 lbs. UL listed. Includes: belt clip. 2" corded 5000 rpm auto-feed screwdriver with AC motor. Corner fit feed system. Tool-free screw length adjustment. Precise depth of drive adjustment with depth lock. Quick slide button bit change. Variable speed trigger with lock and reverse. Belt hook right or left handed adjustable. Includes (1) drywall nosepiece, (1) wood nosepiece, (1) storage bag and (1) Phillips bit. Micro-fine depth adjustment ring in 1/64" increment, adjustable tool-free steel motor cam lock with quick release motor latches, adjustable, tool free steel motor cam lock, quick release motor latches, detachable cordset, clear, Lexan sub base, rubber overmolded handles, right or left switch and cordset location, flat top, self releasing, long, eight slotted collets. Specs: 24,500 RPM, collet diameter 1/2", 1/4", depth stop micro-fine ring, 6" base dimension, 7.1lbs. tool weight. Includes: fixed base router, 1/4" and 1/2" one piece self-releasing collets, (2) wrenches and sub base concentricity gauge. 2" corded 2500 rpm high torque AC motor. Drives: screw diameters #6 - #12, screw lengths: 1" - 2". Variable speed trigger with reverse. Corner access feed system. Tool-free screw length adjustment. Precise depth of adjustment with depth lock. Slide button bit change. Belt hook right or left handed adjustable. Includes: (1) Drywall nosepiece, (1) wood nosepiece, (1) storage bag, (1) square bit and (1) Phillips bit. Micrometer depth adjustor accurate to 1/128", cam lock lever enables simple coarse height adjustments and motor release (fixed base), dust sealed switch and sealed ball bearing construction, precision machined aluminum motor housing and base, auto release collet system for easy bit removal after use, collets included to accept 1/4" and 1/2" shank bits, under table stop, overmolded grips. Specs: 1-3/4 peak HP, 120V/AC, 25-60 Hz, 27,500RPM, 3-1/2" motor diameter, 1/4" & 1/2" collets, round base, LxWxH is 12"x5.5"x8-5/8", weighs 8lbs. Includes: router motor, fixed base, 1/4" & 1/2" collets, (1) collet wrench, carrying case, operating manual. Micrometer depth adjustor accurate to 1/128", Cam lock lever enables simple coarse height adjustments and motor release, precision machined aluminum motor housing and base, dust sealed switch and sealed ball bearing construction, auto release collet system allows for easy bit removal, collets included to accept 1/4" and 1/2" shank bits, Under table stop prevents motor from inadvertently rotating out of base, Over molded grips for greater comfort. Specs: 120V/AC, 25-60Hz, 27,500RPM, 3-1/2" motor diameter, 1/4" & 1/2" collets, 5-3/4" round base, LxWxH (12"x5.5"x8-5/8"), weighs 8lbs. Includes: router motor,1/4" & 1/2" collets, collet wrench, operating manual. Variable speed control with soft starting motor features full time electronic feedback that maintains motor speed through the cut. Dual LED's and clear sub base ensure maximum visibility, adjustment ring enables controlled bit depth changes, large, low-pressure spindle lock button, multiple shaft lock detents, depth ring, clamping mechanism and spring loaded release tabs. Specs: 7.0 amps, 16,000-27,000 RPM no load speed, 1/4" collet diameter, 1.5" plunge stroke, 4" base dimension, 12 position spindle lock, weighs 4.1 lbs. Includes: motor, standard base, wrench and instruction manual. 2" corded 2500 rpm high torque AC motor. Corner fit feed system. Variable speed trigger with lock and reverse. Tool-free screw length adjustment. Sliding screw guide. Precise depth of drive adjustment with depth lock. Quick slide button bit change. Belt hook right or left handed adjustable. Includes (1) drywall nosepiece, (1) wood nosepiece, (1) storage bag, (1) square bit and (1) Phillips bit. Variable speed dial for matching speed to workpiece and task. Macro and microfine bit depth adjustment system with re-settable depth indicator. Precision centering design makes it easy to keep bit on intended cutline when using jigs, templets, dovetail fixtures and similar guidance devices. Right or left switch location for user preference and consistency. Classic hardwood handles. One-piece armature shaft. Soft start reduces start-up torque. Constant Response circuitry maintains constant speed under load. Provides overload protection. RA1161 Fixed base with system has threaded holes for mounting to router table positioned in common 3-hole pattern. Includes 1/4" and 1/2" S.R. collet chuck, 16mm shaft wrench, collet nut wrench, chip shield, 10 ft. flexible rubber cord and t-handle hex height adjustment wrench. Spec: 6" base diameter, 3-3/4" base opening, 1/4", 1/2", and 8mm collet capacity, 10' cord length, 8,000 - 25,000, 120 V AC rating, and 2" subbase opening. Linear depth adjustment features a large steel motor lock lever and depth adjustment gearing via a durable threaded screw integral to the motor itself; both coarse and microfine adjustments are fast and accurate, over molded rubber grip with an adjustable handstrap that allows for left and right handed operation, and two over molded palm grip side handles for superior comfort, router sub base includes a special access hole for a common 3/8" hex extension wrench for above the table depth adjustments. Specs: Max HP 1.7, no load RPM 24,000, collet diameter 1/4"-1/2", depth adjustment range 1-21/32", 6" base dimensions, 8ft, fixed cord, double insulated, rocker switch, 8-1/2" high, weighs 8.8lbs. Includes: (1) router, (2) 1-1/8" collet wrenches, 1/2" & 1/4" collets, carrying case. Rental. Micrometer depth adjustor accurate to 1/128", GripVac handle allows for both single hand gripping and enhanced router control when used in conjunction with standard knob, D-handle incorporates trigger switch with lock-on feature, precision machined aluminum motor housing and base, dust sealed switch and sealed ball bearing construction enhance tool durability, auto release collet system allows for easy bit removal, collets included to accept 1/4" and 1/2" shank bits. Specs: 120V/AC, 25-60Hz, 27,500RPM, 3-1/2" motor diameter, 1/4" & 1/2" collets, round base, trigger switch, LxWxH (10.5"x7.75"x8-5/8"), weighs 9.25lbs. Includes: router motor, D-handle base, 1/4" & 1/2" collets, collet wrench, operating manual. High power motor for metal fastening applications. Helical-cut steel, heat-treated gears for smooth operation and longer life. Rubber-grip and two-finger trigger for increased comfort. Versa-clutch torque adjustment system to dial the proper torque needed to efficiently drive fasteners without stripping or breaking fastener. High power motor for increased durability and longer life. Metal nose and gear case for durability on the job. Designed for steel stud framing, general framing decking/phillips screws and self-drilling hex head screws. SPECIFICATIONS: 6.5 amp motor, 0-2,500 RPM, 132 in. lbs. torque, #14 max. fastener. 3.2 lbs. tool weight. For sheathing, subflooring, underlayment, cement board, fencing, and wood or composite decking. Drives screws from 5/8" to 3" in lengths. Use stand-up mode for horizontal surfaces or hand-held for vertical surfaces. "Feed-on-return" functionality. Use screw gun with or without extension or drive loose screws with nose cone. Fast depth-of-drive adjustment. Includes auto-feed attachment, extension pole (for standing applications), adjustable handle, toe-nail nose piece (installed), no-mar nose piece, #2 Phillips, #2 square bits, rex drive bits and nylon storage bag. Specs: 4000 RPM. Variable speed control enables bit speed to be optimized for changing applications, rack and pinion adjustment provides fine depth, settings to 1/128", dual position switch allows user to cut power while maintaining control of the router, overmolded grips for greater comfort in extended use, spindle lock for single wrench bit changes, durable latch lever, collets included to accept 1/4" and 1/2" shank bits. Specs: 120V/AC, 60Hz, no load speed 10,000-23,000RPM, 3-1/2" motor diameter, 1/4" & 1/2" collets, round base, 9"l x6"w, height: At Zero-9.9", tallest-11.1", weighs 9lbs. Includes: router motor, fixed base, 1/4" & 1/2" collets, collet wrench, carrying case, operating manual. Clear, Lexan sub-base provides enhanced base durability, bit visibility, and accepts standard template guide bushings, heavy duty, machined die-cast aluminum base and motor housing, sub base concentricity gauge included to ensure bit concentricity, machined brass bushings, case-hardened steel guide rods, quick release motor latches, detachable cordset, adjustable, tool free steel motor cam lock, dust-Sealed Switch, easy to reach plunge lever and switch, five position, adjustable turret, micro-fine depth adjustment on plunge base, flat top, self-releasing, long, eight slotted collets, right or left switch and cordset location, rubber overmolded handles and low center of gravity. Specs: no load speed 24,500RPM, collet diameter-1/2", 1/4", plunge stroke - 2-1/2", depth stop- micro-fine depth adjustment ring, base dimension 6", weighs 10.0lbs. Includes: motor pack of (1) fixed base, (1) plunge base routers, 1/4" and 1/2" collets, (2) wrenches, sub base concentricity gauge, vacuum adapter, kit box. 2-1/4 HP Combination Plunge- and Fixed-Base Router has the power to get results, with a 12 Amp motor and adjustable speed settings. The variable-speed dial allows the operator to set the optimal speed. Constant Response Circuitry, the router will maintain a constant speed throughout the cut, resulting in clean, accurate product. The plunge base features smooth plunge action. Users can glide along the intended cutline using dovetail fixtures, templates, jigs and other guidance devices. The Bosch Precision Centering Design allows the bit to be centered with the sub-base or optional template guides.Specs: 120V/AC, base diameter: 6" fixed/6-11/16" plunge, 1/4, 3/8", 1/2", 8mm collet capacity, no load RPM: 8,000-25,000, 10ft. cord, weighs 19.5lbs. Includes: plunge base, fixed base, fixed base chip shield, plunge base chip shield, 1/4" self-releasing collet chuck, 1/2" self-releasing collet chuck, 16mm shaft wrench, 24mm collet nut wrench, T-handle hex height adjustment wrench, carrying case. Electronic variable speed with full feedback control for constant speed under load and soft start to reduce start up torque, micro fine depth adjustment ring provides precise depth adjustments in 1/64" increments, adjustable, tool free steel motor cam lock, through-the-column dust collection, quick release motor latches, detachable cordset, subbase concentricity gauge, machined brass bushings and case-hardened steel guide rods, spindle lock button, clear, Lexan subbase provides enhanced base durability, bit visibility, and accepts standard template guide bushings, rubber overmolded handles and low center of gravity, dust sealed switch, heavy duty, precision machined, die-cast aluminum base and motor housing, nickel plated motor housing. Right or left switch and cordset location, flat top, self-releasing, long, eight slotted collets, five position, adjustable turret, micro fine depth adjustment on plunge base 5/128" per turn for precise routing in veneer and inlays, easy to reach plunge lever and switch. Specs: no load speed 8,000-24,000RPM, 1/4" & 1/2" collets, plunge stroke-2-1/2", depth stop micro fine depth adjustment ring, 6" base dimension, spindle lock, weighs 10.1lbs. Includes: motor pack, fixed base, plunge base, 1/4" & 1/2" collets, wrench, sub-base concentricity gauge, large hole sub base, vacuum adapter, kit box. Drives flexible strips of 50 screws from a standing position, or remove the extension for close-up work. Capable of working with or without the extension pole. Easy depth-of-drive screw adjustment. Quick release for easy bit access. Flooring extension snaps on and off. Kit includes: 2,500 rpm screwdriver, 1/2"-3" auto-feed attachment, 21" extension pole, nylon storage bag, adjustable handle. "No-mar" nose piece, #2 Phillips, #2 square, and hex drive bit (specialized head configuration). Weighs 7.0 lb with extension and 5.5 lb without extension. Heavy-duty power for fast, clean cuts. Multi-slide scale and index system for accurate plunge depth adjustment. Variable electronic speed control with soft start switch prevents torque kick-back. Three position adjustable handles provides more comfort and control during use. Lightweight design facilitates maneuverability and ease of use. Optimal for fine milling applications. Exclusive accessory pack comes standard. STANDARD EQUIPMENT: Straight guide, bar holder, feed screw, 3 wing bolts, 11/16" template guide, wrench, straight bit, chuck sleeve, template guide adapter, 2 lock springs. SPECIFICATIONS: 15 Amps, 3.25 horsepower, 1/2" max collet capacity, 8,000-20,000rpm no-load speed, 2-7/16" plunge stroke, spindle lock, base dimensions 7-3/32" x 2-3/4". 2500 rpm high-torque motor. Corner-fit feed system. Tool-free screw length adjustment. Precise depth of drive adjustment with depth lock. Quick slide button bit change. Variable speed trigger with lock and reverse. Belt hook right or left handed adjustable. Includes (2) 18 volt Li-Ion batteries, (1) charger, (1) drywall nosepiece, (1) storage bag and (2) drive bits. Full wave electronic variable speed motor with soft start runs, rack and pinion depth adjuster, integral dust collection system, spindle lock button, rubber-coated knobs have plunge-lock and on/off built-in, one-piece motor shaft and spindle ensures perpendicularity and accuracy, guide Bushing adapter plate accepts standard guide bushings for template work, phosphorous bronze bushings provide a smooth and accurate plunge, micro-fine depth adjuster. Specs: no load speed 8,000-24,000RPM, 1/2", 1/4" collet dia., 2-1/8" plunge stroke, depth stop 3 stage turret stop, base dimension 4-5/16 x 6-1/4", spindle lock, weighs 9lbs. Includes: 1/4" and 1/2" collets, template guide bushing adapter, wrench. Expanded depth settings for high-density flooring materials. Reversible and replaceable non-skid teeth. Uniform toe-nailing and countersink on slick surfaces. Sure-grip guide tube increases stability for a broad range of screws. Uses include: Decking on decks and docks, subfloor to wood or steel, wall plates, stair treads, sheathing and fiber-cement siding to steel. Includes: (1) PRO300S Decking attachment, (1) extension for stand-up driving, (1) Quiver for keeping screws at your fingertips, (1) decking nose clip, (1) DeWalt, Makita or Milwaukee screwdriver motor and (1) tool case. Electronic five speed motor accommodates various router bit cutting diameters and applications, soft start feature reduces torque at star up and motor maintains constant speed under load, auto release collet system allows for easy bit removal after use, precision machined aluminum motor housing and base, base includes large integrated cast handles for stability and durability, dust sealed switch and sealed ball bearing construction. Specs: 120/AC, 60Hz, no load speed: soft starting 5 speed at 10,000, 13,000, 16,000, 19,000, and 21,000 RPM, 4.2" motor diameter, 1/2" collets, 7" round base, LxWxH (11"x7"x11") weighs 14.5lbs. Includes: router motor, fixed base, 1/2" collets, collet wrench, operating manual.